If you are a webtoon fan with bilingual skills, you are ready to participate! Keep to the original context. Do not use vulgar language or automated translations. Many countries do not have LINE WEBTOON available yet. Ready to begin now? There are two ways to participate. Wiki Translation is open to everyone. translating, proofreading or editing font formats. Team Translation is only open to exclusive groups. as team manager and create your own team. Still curious? Here are some frequently asked questions. Answer: No, because WEBTOON TRANSLATE is a service where the translation of a webtoon is carried out under the agreement of the original author. Completed translations will be serviced through LINE WEBTOON, and all contributors will be credited. Skilled translators may have an opportunity to debut as an official translator of LINE WEBTOON. 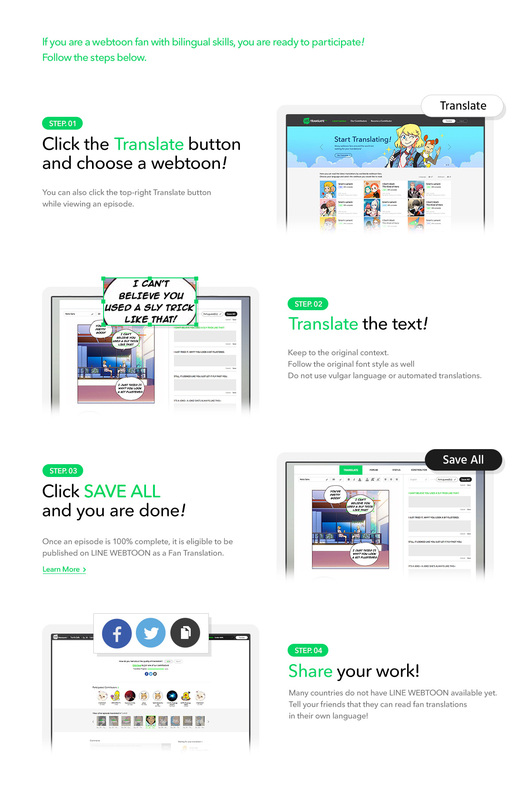 Answer: LINE WEBTOON has a Fan Translation menu, which shows the translations done on WEBTOON TRANSLATE. To be shown on LINE WEBTOON, there must be at least 5 completed episodes per webtoon, and only 100% completed episodes will be uploaded. Please be aware that there is an internal screening process to ensure the quality of translations. This process usually takes one working day after you complete an episode. Also some webtoons or episodes are only viewable on WEBTOON TRANSLATE due to LINE WEBTOON's regional policies. Answer: You can either send a message to an existing team and ask to become a member, or you can apply as a team manager yourself. To be eligible as a team manager, you must have translated at least 1,000 sentences on our platform. After meeting the requirements, send an e-mail to dl_webtoontrans@webtoonscorp.com to apply for the manager position with the following information: 1) "My Profile" URL, 2) the language of your choice, 3) other translating experiences, if you have any. We will determine your eligibility based on the information you provide as well as your activities on WEBTOON TRANSLATE service. Answer: Not all webtoons are currently available on our platform. Click Feedback on the bottom of the page and send us your request. We would love to hear what the global audience wants to read! Requests for new languages and suggestions for new features are also welcome.